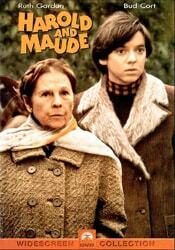 Harold and Maude is a love story, but with a catch: the young man, in his early twenties, is obsessed with death. The woman he loves, almost sixty years his senior, is irrepressibly obsessed with living life to the fullest. If there are any film fans out there not yet seduced by Hal Ashby’s 1971 dark comedy, it’s time to give it a chance. Harold and Maude, which now appears on many critics’ best-movies lists, has become a touchstone film for its generation. This unconventional love story brings together a death-obsessed eighteen-year-old and a woman almost sixty years his senior—who happens to be irrepressibly bent on living life to the fullest. Maude Chardin is played by the beloved Ruth Gordon, a forever free-spirited veteran of stage and screen. Bud Cort, with his wide-eyed, virginal, deadpan face, hilariously underplays the spoiled and inscrutable Harold Chasen, whose particular antics we dare not reveal lest we spoil the fun. You might also recognize an uncredited Tom Skerritt as an amusingly befuddled motorcycle cop. The production of Harold and Maude was a milestone for many of the talented artists involved. The stellar screenplay was written by UCLA student Colin Higgins for his master’s thesis, and Cat Stevens cemented his career by providing the movie’s reflective soundtrack. It’s altogether a masterful team effort that has only grown in reputation with age. The WGA named it in their list of the best scripts of all time, and you’ll see why when its laughs and surprises keep you thinking about it for days afterward.